Sure, chips and salsa are all well and good, but wouldn't it be nice to spruce up your Sunday afternoon beer-and-football routine with something a little more upscale? To commemorate its new line of tortilla chips, Popchips has teamed up with The Food Network's chef Aarón Sanchez to create the classiest — and yummiest — snack recipes this side of the freezer aisle. Luckily for you (and your taste buds! ), we got our hands on these exclusive recipes. 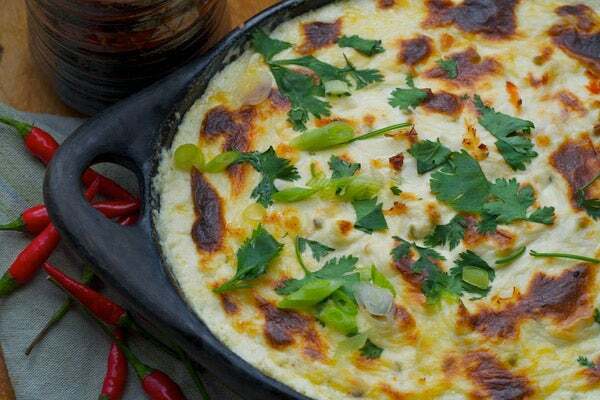 From crab dip to ceviche, these munchies will impress all your friends on game day. Read on to learn the steps, and get to cookin'. 1. Make the Chipotle Love: In a dry, medium-heavy, nonreactive sauce pot, place oil and garlic cloves and cover with foil and place in 300 degree oven for 45 minutes 'til garlic has browned and become soft. Remove from oven and allow to cool. Then place remaining ingredients and cooled garlic oil mix in a food processor and puree till a smooth paste. 3. Split each chicken breast in half horizontally and lay each piece between two pieces of plastic wrap. Pound each breast half until it’s one-quarter inch thick (if you don’t have a meat pounder, use the bottom of a small saucepan). Sprinkle each piece with salt, pepper, and cumin on each side. 4. Mash the avocado with the lime juice and season with salt, and warm the refried beans on the stove top or in the microwave. 5. Grill the chicken breasts for four to five minutes, turning once. Set aside and keep warm. Split the buns and brush lightly with olive oil. Grill, cut sides down, until just golden brown, about a minute. 6. To assemble each sandwich, spread the bottom half of each toasted roll with a quarter of the mashed avocado. Top with a chicken breast, then spoon on a quarter of the refried beans. 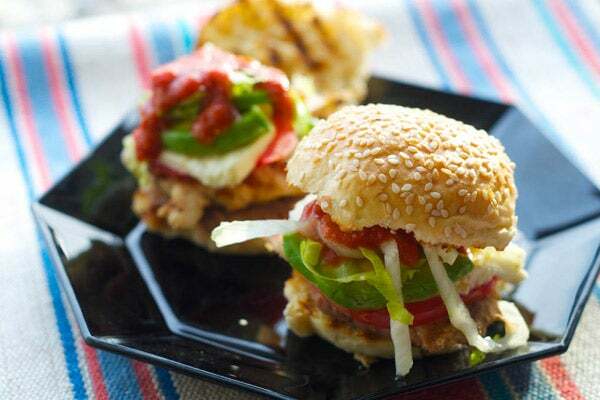 Divide the cheese among the sandwiches, and top with tomato, lettuce, and a sprinkle of cilantro. Drizzle on a generous amount of Chipotle Love and top with the remaining bun half. Cut each sandwich in half before serving. 1. Preheat the oven to 350 degrees and grease a one-quart baking dish. 2. In a mixing bowl, blend the cream cheese and mayonnaise with an electric mixer on medium speed. Blend in the buttermilk, lime juice and salt until the mixture is smooth. 3. Using a wooden spoon or rubber spatula, gently fold in the crabmeat. Turn the mixture into the prepared baking dish. Bake for 30 minutes, until the mixture is golden and bubbling. 4. Sprinkle with the cilantro and scallion and serve warm with ranch tortilla Popchips to scoop up the dip. 1. In a medium-sized glass bowl, combine the fish with the lime juice, Serrano, and salt. Cover and refrigerate for three to four hours. The fish cubes will “cook” in the lime juice until they are opaque. 2. 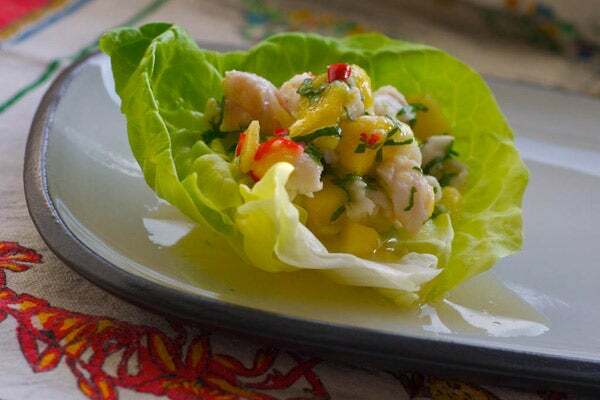 Half an hour before serving, stir the mango, scallion, cilantro, and olive oil into the ceviche. Cover and refrigerate 20 minutes to let the flavors meld. Serve with chili limón tortilla Popchips for scooping up the ceviche. 1. 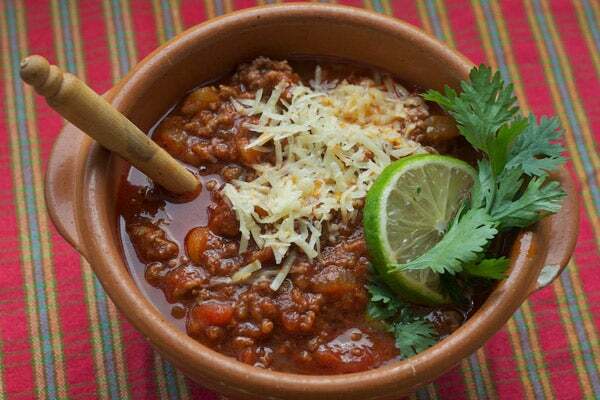 In a dry skillet over medium heat, toast the guajillo chilies on each side for 30 seconds, until just softened. Put them immediately in a glass bowl and pour the boiling water over them to cover. Soak for 15 minutes. 2. In the same dry skillet, toast the tomatillos and garlic, turning several times until the vegetables have softened slightly and the exteriors have brown marks, three to four minutes. Discard the paper skins on the garlic. 3. Put the guajillo chilies in a blender with the soaking water, the tomatillos, the peeled garlic, and the chipotle chilies in adobo. Pulse to make a smooth puree. 4. In a large stew pot over medium heat, cook the onions until softened and just turning golden, six to seven minutes. Add the ground beef and cook through, breaking it up with a spoon as you cook, about 10 minutes. 5. Add the pureed chiles and tomatillos, the tomatoes, ancho chile powder, cumin, salt, and a few grindings of black pepper. Bring to a boil, reduce heat, and simmer for one hour, loosely covered, until the deep orange-red sauce is thick. You may need to add a little more water, but take it easy. The finished chili should not be too wet. 6. Taste and add more salt and pepper if needed. For each serving, put a handful of nacho cheese tortilla Popchips in the bottom of a bowl and ladle a serving of chili on top. Scatter with a handful of cheese and eat at once.